I really love bread and baked goods. As far back as I can remember I have wanted donuts over potato chips, bread over Cheetos. My mother on the hand had a rather large potato chip and popcorn obsession. She could take or leave bread, but anything salty she would go to town on. When I had my doctor confirm my fears that gluten was the reason I was having a vast array of problems I had my food life flash before me. No more bread or baked goods, I was devastated. However, I then got determined. There was no reason I couldn't still eat the foods I love with a few changes. So I set about re-working recipes to be gluten free. I have been lucky that I have had far more successes than failures. Next week is Thanksgiving and then Christmas will be here before you know it. I am a little nervous about dealing with being gluten free during the holidays. I have a major sweet tooth and I know that almost all the food will be things I can't have. So I have been making all my favorites at home modified. Last week I made pumpkin bread and muffins and they were delicious. Next week I am going to attempt a gluten free pumpkin pie. One of my favorite baked goods is cornbread. Cornbread with butter and honey is so good! 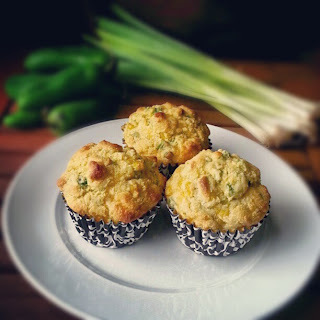 Last month I tried a new recipe for Gluten Free Jalapeno and Cheddar Cornbread from the November issue of the Food Network Magazine, which looked easy and flavorful. This recipe has 13 ingredients. It takes a total of 1 hour, 25 minutes of which is active and makes 6 to 8 servings. I had no problems finding any of the ingredients at my local grocery store and I made no ingredient modifications. I found a great gluten free flour that uses coconut flour. It is perfect for gluten free baked goods, my two boys can't tell that they are eating gluten free. I have a horrible time with cast-iron skillets. Growing up in the Northwest I never owned one until I moved to West Virginia. The first year my husband and I were married my mother-in-law gave me a cast iron skillet. I washed it and it rusted. That was a lesson I learned quickly. I also decided that I am horrible about keeping cast iron seasoned. So I rarely use cast-iron skillets, I just can't seem to get the hang of them. For this recipe I made muffins instead. The recipe made a total of 12 muffins, which I cooked at 400 degrees for 20-25 minutes. Make sure not to overly stir the batter. Stir just until combined, it will make your cornbread rise more effectively. I followed the remainder of the recipe as written. For gluten free cornbread this turned out pretty well. I would suggest a few changes though. First, I would not seed the jalapenos. The cornbread needed more flavor and keeping the seeds would definitely provide this. Second, I would add more fat into the batter. I always use bacon grease melted into the bottom of the pan or muffin tin. This method would definitely help this recipe. Most cornbread recipes have at least 1/4 cup of butter, so the fat in this recipe needs to be increased. Finally, instead of cheddar cheese I would use Monterey Jack. The cheddar cheese just ends up tasting a little on the bland side. With these changes I think this recipe could be a great gluten free option. For the recipe go to Gluten Free Jalapeno and Cheddar Cornbread. I go gluten free a lot because it's better for my IBS and cornbread is something I miss terribly! Can't wait! It is hard going gluten free, there are so many things that just don't taste the same :) This recipe with some changes though is pretty good. Great blog! Here through the hop. I followed yours through Goggle connect. Stop over and see us! Would love to connect. Thanks for the sweet comment, followed you back :) Come back again soon! Thanks for following back :) There are a lot of great gluten free recipes, it just takes some work to find them. This one if the fat was increased would be great as a side for chili or stew. These look amazing! Thank you for linking up to Wonderful Food Wednesday. Can't wait to make these with my family. Thanks :) If you end up trying the recipe tell me how it turns out! Thanks for hosting!